Theme of How To Draw Dog, especially how to draw your loved one is I guess among top priorities of every dog lover. I personally love Jack Russell. 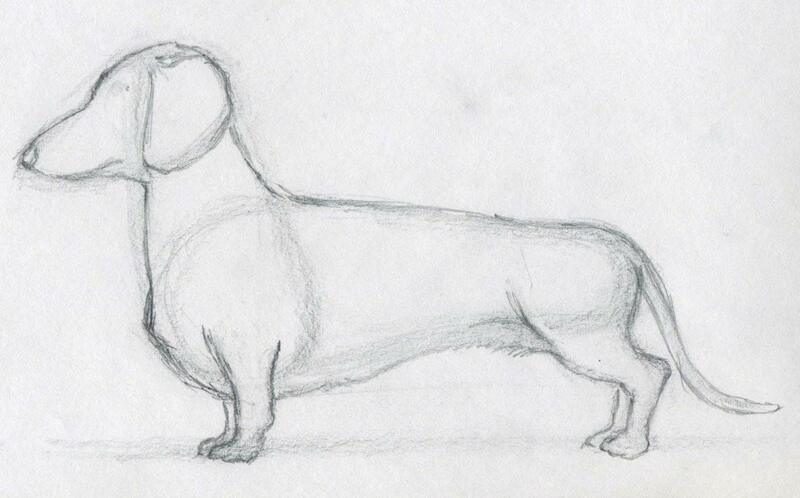 However, I received a good hint to draw a Dachshund. 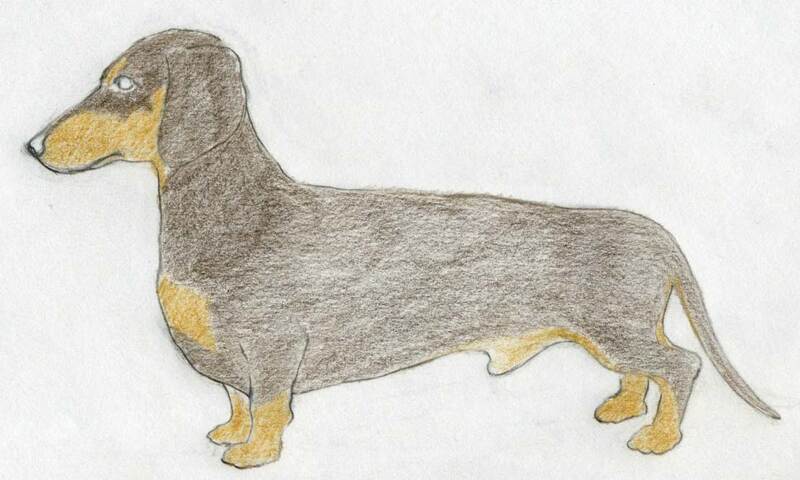 Yes, Dachshund may be one of the best breed to start with drawing a dog. 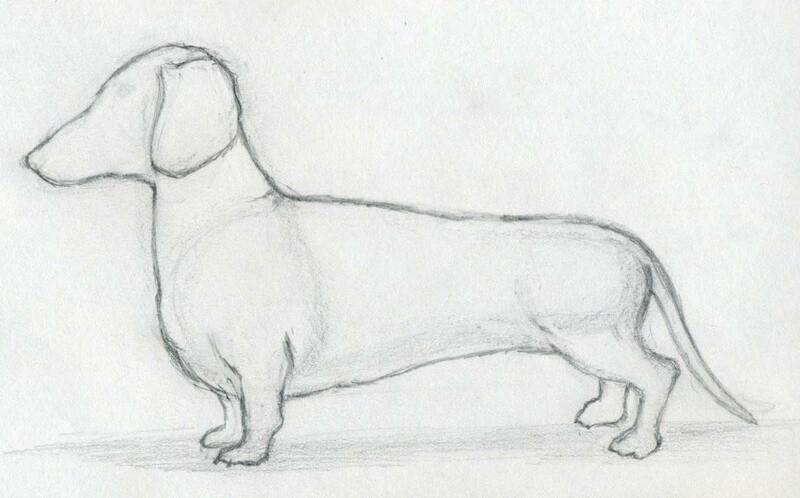 It has an unusual shape of body which allows you practice better the proportions and balance of each part of dog’s body. Dachshund is exceptional. 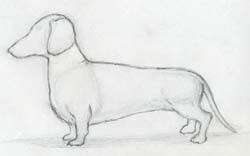 If you checked out the basic steps for drawing animals, then you probably know that similar procedure is applicable when you draw dog too. It is that simple. Every animal has a certain shape of the body. The body can be then divided into smaller and easier approximate shapes (balls, ellipses, triangles, etc), which can be then merged into a whole picture. Really the process is easy. 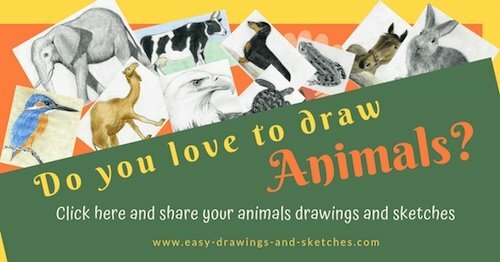 Using this technique, you can literally draw any animal you like. Dachshund’s body proportions are easy to outline because every part is of distinctively different size and shape. 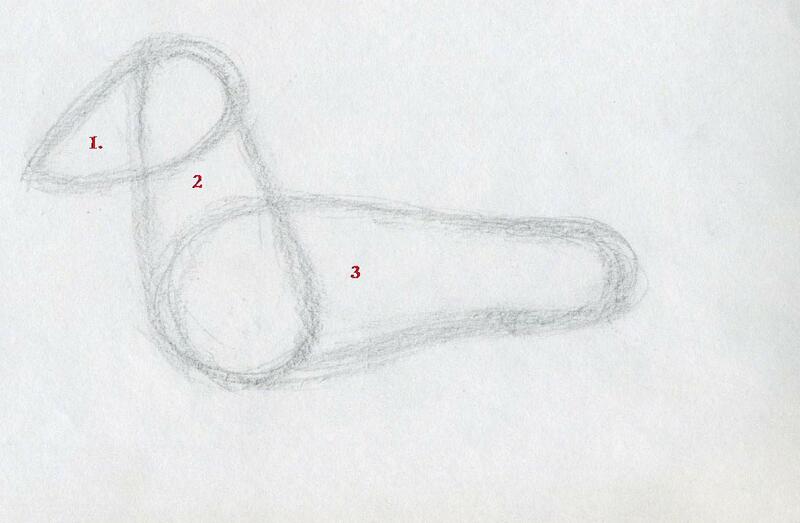 Make a rough initial sketch of head, neck with chest and the trunk. I drew them in this sequence but you can begin where you feel most comfortable. 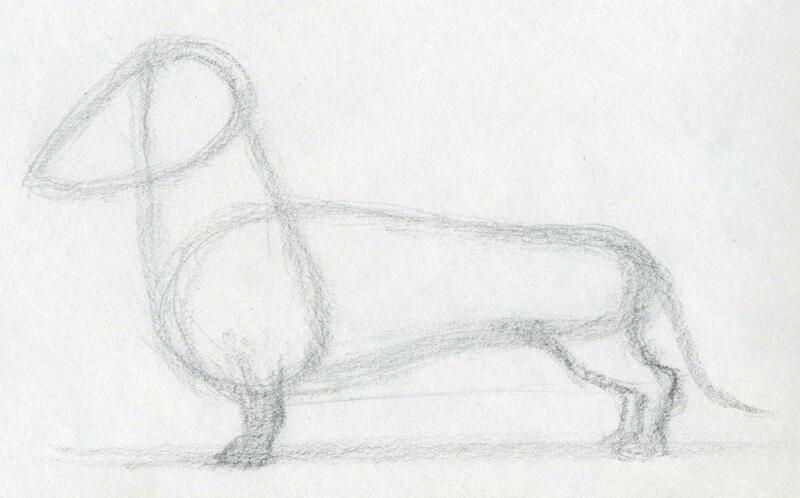 Basically, when you draw dog, this initial sketch makes your work easier. Now, you can gently outline the legs and the tail. 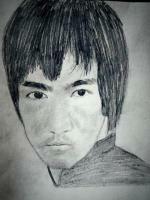 Do not mind if the sketch is not as perfect as you wish. We’ll correct it on the go. 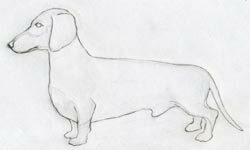 Now, begin to draw an outline contour of the body. Again, be easy about it. If you do not get it on first trial, you can re-draw it. 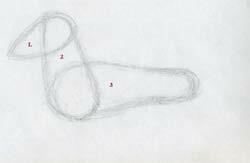 Draw this body outline contour by soft and gentle pencil line, because you may want to correct - erase some parts later. While you draw dog remember, that no drawing is ever perfect. That’s why we enjoy drawings. There is always this element of inaccuracy which makes it so personal. That’s why we buy rather drawings and paintings than photos. Notice, here I changed the position of legs. They are slightly opened, so that the dog looks more natural. 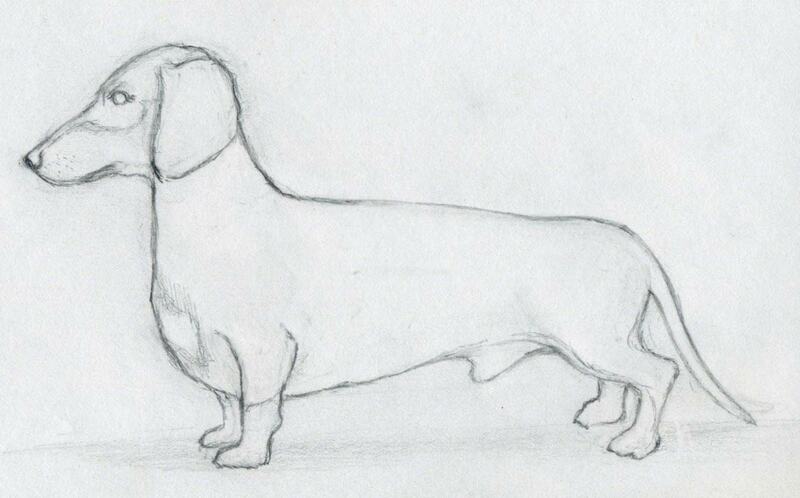 When you draw an animal or when you draw dog, it is good to draw the legs a bit opened. 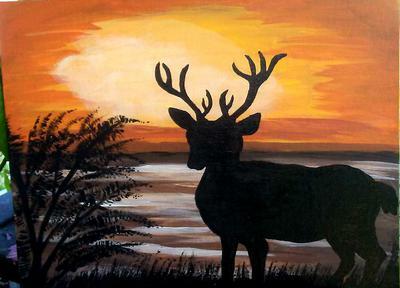 It creates more of a three-dimensional impression on the picture even if the actual animal would just stand all legs together. Also, I gently modified some parts of the contour, namely on the head, and nose. Originally I didn’t want to post this step, but I want to show you how you can alter the shapes and contours during drawing as necessary. No initial sketch is ever perfect. Let’s be easy about it. I altered the front leg but only a little. If I wouldn’t do that I think no one would notice, but I feel it is better now. So can you alter any part if you feel it would resemble better to the photo, or a live model. Outline the eyes. This is important. 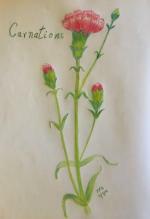 If you are not sure, please sketch the eye first on a separate paper. 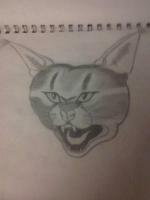 The eyes absolutely should be as perfect as possible if you want your animal drawing look good. Observe detailed photo of a dog’s eye. Study it. Although there aren’t many details visible on this drawing but the basic outline should match the dog’s face impression. You can sometimes make these changes while you draw dog. This Dachshund will be made in two colors. Dark brown (almost black) and light brown. 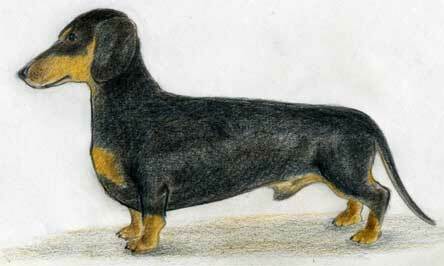 The nose and area around mouth, the bottoms of legs and the belly which is not very visible from this angle are light brown. 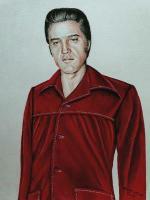 Now, take a sharpened dark brown pencil and outline the final contour of the whole body. Push the pencil gently, please! Do it by one single line if possible. 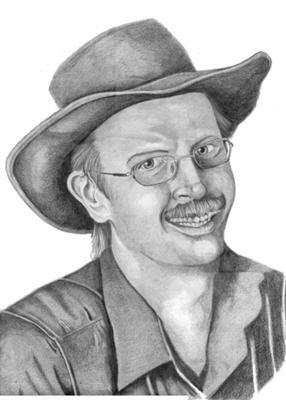 Erase the original graphite sketch so that only one single dark brown pencil outline will remain. You have now a perfect template or even a coloring book base for a dog drawing. I guess no further guide is necessary….Now you can do all the rest without my comments. There is however one important detail that we should remember. Every dog has a natural masculine body. 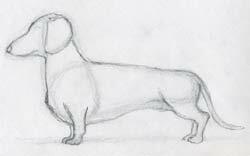 The muscles are often visible and they should be outlined in the drawing in order to make the dog look as realistic as possible. We will do it by shading. Now you’ll need two brown color pencils. One dark brown and one light brown. This step looks more like a flat rendering – in fact it is. Color the dog as you see on the picture or as you see on your own photo. No shading yet. Just simple flat color. Leave the eye blank for now. As I mentioned before, when you draw dog it is good to slightly outline the masculine body. This can be achieved by shading. 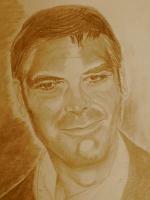 Shade the body dark brown pencil as you see on the picture. Here I want you to use your own creativity and if possible always try to make it better than mine. Darken gradually the dog’s body by black color pencil. Since the basic color is made in brown, the black pencil won’t look like real black, which is good. Shade the rest of the body. Again, try to make it better than me.